Gene Wilder | WHAT A FEELING! Here are a pair of chillers with only one thing in common: They’re not scary. The less said about Haunted Honeymoon the better. If you’re a fan of Gene Wilder’s, as I am, you’ll probably come away from his latest film (he stars, directs, and co-scripts) terribly depressed. Wilder has a few funny moments as an actor, but he clearly doesn’t know how to make movies. This 80-minute trifle is shockingly inept in the simplest business of storytelling; you’re never even quite sure who the characters are supposed to be, let alone why they’re doing what they’re doing. Wilder and Gilda Radner play radio actors from the heyday of radio drama who spend an evening in Wilder’s family home, a brooding old mansion straight out of the Universal horror films of the early 1930s. Some lame explanation about Wilder’s uncle (Paul L. Smith) wanting to scare Wilder for medical reasons is given, but it makes no sense. Once inside, the scares aren’t scary—except perhaps for Wilder’s aunt, played by Dom DeLuise, who isn’t supposed to be scary—and the jokes aren’t funny. Some good actors are wasted, especially the brilliant Jonathan Pryce (Brazil) and Bryan Pringle, who takes the Marty Feldman butler role. Now to someone who knows how to scare: Stephen King. Having seen a raft of movies released under his name—and reportedly growing increasingly upset about the rock-bottom quality of most—King has finally gotten a chance to direct a movie. It’s Maximum Overdrive, based on an early King story called “Trucks.” And it’s all about the Earth going crazy when it passes through some kind of force field (possibly a comet’s tail) and all the machines becoming malevolent. Especially these trucks, which descend on a North Carolina truck stop called the Dixie Boy and scare the bewhoozis out of the people inside. All right, so it doesn’t sound that scary. But Steven Spielberg proved once and for all that a truck could be a very frightening thing, in Duel, so surely Stephen King can do it—right? No, not really. I’ve not read the story, so I don’t know if King made it work there. But Maximum Overdrive, after a burst of inspiration in its opening sequences, soon becomes mired in the dull situation at the Dixie Boy. Some of the ingenious and sick touches in the early going suggest a nutty promise. A drawbridge goes haywire and dumps it riders all over the road. A Coke machine goes berserk—all that caffeine, probably—and kills by spitting out cans. A driverless ice cream truck prowls suburban streets looking for human prey, while “King of the Road” tinkles from its bell. But then King’s well of inspiration runs dry. Back at the Dixie Boy, we watch as the short-order cook (Emilio Estevez) haggles with the redneck owner (Pat Hingle) and romances a hitchhiker (Laura Harrington). King does manage a few gross, effective, perverse touches. What he doesn’t manage to do is to make a particularly scary movie. To give King the benefit of the doubt, I’d like to believe this has more to do with the simple choice of poor material than with his talents as a director. Next time, no trucks. How about an old, dilapidated mansion on a rainy night full of weird people with a lunatic in the cellar…. It doesn’t seem that a movie with Dom DeLuise in drag could be entirely awful, but there you go. 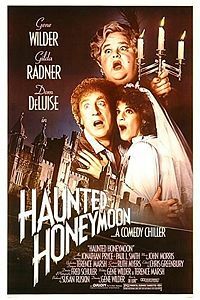 If anybody deserved to make good movies together, surely Gene Wilder and Gilda Radner did, but it didn’t go that way (I have a review ready to go of Hanky Panky here, too, and it’s hard to know which movie is worse). According to IMDb.com, Stephen King has said he was coked out of his mind while making Maximum Overdrive. I still think it would be interesting to see him direct something, although his “author approved” TV version of The Shining suggests he doesn’t grasp certain things about how scary movies succeed vs. how scary books succeed. Not that I’m questioning his expertise in the latter, but…let’s see how he directs again.